Archive by Category "Snow Removal"
Do You Need a Commercial and Residential Snow Removal Provider? A&M Asphalt Paving Can Take Care of All Your Snow Removal Needs. Winter’s coming – in fact, snow has already started in many parts of the country. If you haven’t decided how you’re going to handle snow removal at your home or business, you should consider A&M Paving for all your snow removal needs. If you have a long driveway or a commercial parking lot that needs clearing on a regular basis, turn to A&M Paving for your snow removal needs this season. Why Hire a Professional Snow Removal Expert? When you select commercial snow removal service, you get an experienced, insured and professional snow removal company that will quickly and efficiently clear your parking lot, pathways, or home driveway. A&M has the equipment for large areas. For all business owners who value their time, A&M will get your snow removed quickly so you can gain access to your building for your staff and customers. 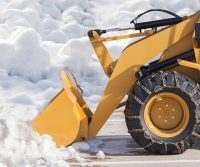 What Can I Expect from Professional Snow Removal? Depending on the size of your lot, there are several ways A&M can clear it. They have a bobcat for deep drifts or steeper areas and a truck plow that quickly clears flat surfaces. After they’ve moved all the snow and ice with the plow, they can spread rock salt to melt lingering ice, keeping your outside surfaces safe for customers and employees. For smaller spaces, and to clear out the in-between areas, they will also hand shovel or snow blow walkways and paths. When you contract A&M paving for your winter parking lot needs, you’ll get their years of expertise in safety clearing parking lots and residential driveways. They know how to effectively remove drifts and salt the icy places which will keep you and your customers safe. When spring comes, A&M can also sealcoat your paved areas to keep winter snow and ice from damaging your parking lot and/or driveway. Contact A&M Paving for Your Snow Removal Needs. If you are looking for cost-effective and qualified asphalt paving experts that also can help with all your snow removal needs, contact A&M’s professionals for high-quality paving solutions. Let us help improve the value of your property today!